The Green Mountain College men's basketball team played its final home game at the Eagle Dome on Saturday, Feb. 2, against Bryant-Stratton College-Buffalo. The last home game in school history for Green Mountain College men’s basketball team was Saturday, Feb. 2, when the Eagles defeated Bryant-Stratton College-Buffalo, 81-53. The win brought Green Mountain’s record to 16-6 this year. VPR’s Ric Cengeri attended the game and shared his observations on Mitch's Sports Report. 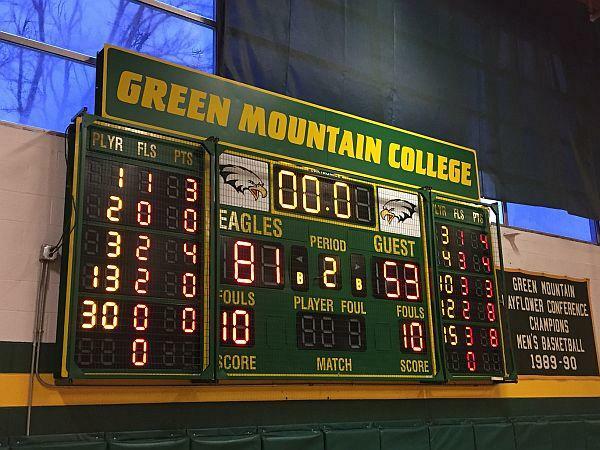 As the final buzzer sounded, the Green Mountain College Eagles were victorious. 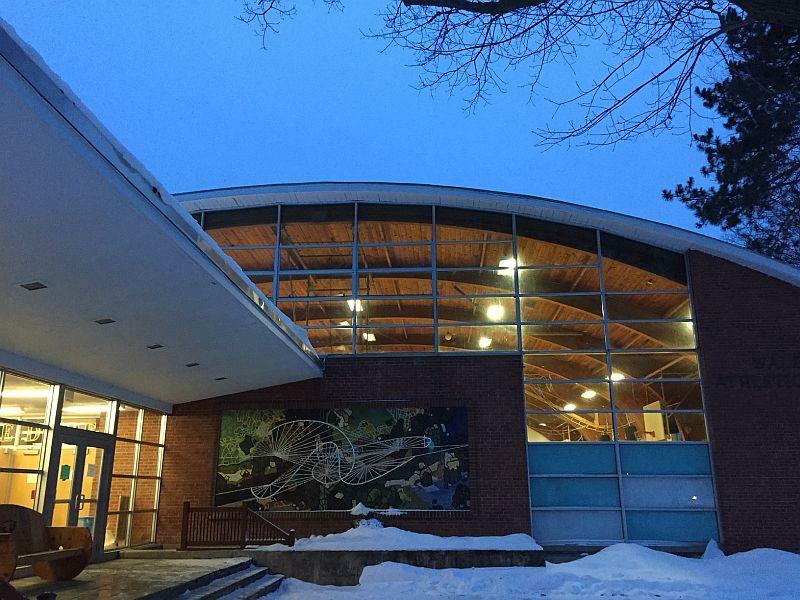 Green Mountain College plays its home games at the Waldron Athletic Center, more affectionately known as the Eagle Dome. It's wooden-arched roof reminds visitors of UVM's Gutterson Field House and creates a cacophonous venue even when there are only 100 fans in attendance, as was the case for the final game. GMC alum Mike MacDougall was a shooting guard for the Eagle teams in the late 1990s that won three Mayflower Conference titles in his four years on the team. He attended Saturday's game with his son, Mason, and described his feelings about the program's final home game. "It is bittersweet, and we'll kind of feel a little bit of a heavy heart today as we watch the final game at the Eagle Dome," said MacDougall as the game was about to begin. Also in attendance was Crispin White. After graduating from Castleton State (now Castleton University), White was the assistant men's basketball coach at GMC in the late '80s and now is the director of student success at the College of St. Joseph in West Rutland. White says he has loyalty to all three schools despite being long-time athletic rivals. On the closing of Green Mountain College, White said "it's definitely sad, but definitely from my standpoint, I’m just proud of what’s been accomplished here athletically and academically." Green Mountain College has played its home basketball games at the Waldron Athletic Center, commonly called the Eagle Dome. After the victory on Saturday, Green Mountain sophomore guard Tyrell Johnson talked about the closeness of this year's team. "We have good energy all around," Johnson said. "I think it’s just a group of guys who mesh well together and we kind of just love playing with each other. And knowing that it’s our last few games together, we’re just trying to enjoy every moment we have." The men's team has five road contests remaining, including Thursday, Feb. 7, at the College of St. Joseph and Tuesday, Feb. 12, at Vermont Technical College in Randolph Center. The Green Mountain College women's team plays its final home game at the Eagle Dome on Tuesday, Feb. 12, versus Davis College. Many students, faculty and people living near Green Mountain College say they are saddened but not necessarily shocked by the news that the 185-year-old school will close in May. Green Mountain College is closing at the end of the spring semester. The Poultney school, which has struggled with declining enrollment and higher costs for years, informed students of the decision Wednesday. It's not a trend the Boston Bruins want to continue. For the second consecutive game, the Bruins took a one goal lead into the third period, and as they did in their last contest, failed to hold that lead on their own home ice, eventually losing in overtime 3-2. The Boston Bruins had a nine-day break from NHL action, a combination of every team's bye week coinciding in their case with the league's all-star game, and they returned looking energized in the early going against the Winnipeg Jets at TD Garden last night, jumping out to a 2-1 lead after two periods of play.